Engrailed 2 is a transcription factor belonging to the class of homeoproteins. These proteins possess a 60-residue DNA binding globular domain and play an important role in the early stages of development. We expressed and purified a 13.4 kDa fragment of Engrailed 2, which comprises a 54-residue N-terminal extension in addition to the homeodomain region. Almost all backbone and side-chain resonances have been assigned. The weak dispersion in the proton dimension of the 1H–15N HSQC spectrum indicates the presence of disordered regions that do not belong to the homeodomain. 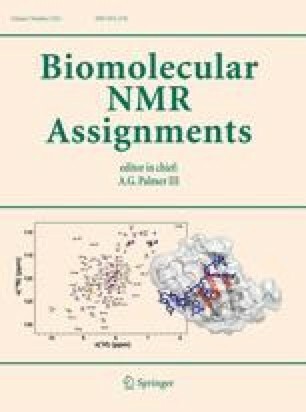 This work is a first step toward the NMR investigation of the structure and dynamics of Engrailed 2 protein that contains a well-structured globular domain and partially disordered regions. Financial support by the Access to Research Infrastructures activity of the 7th Framework Programme of the EU (Contract 228461, EAST-NMR) for conducting research in Warsaw is gratefully acknowledged. Wiktor Kozminski and Jan Stanek (Department of Chemistry, University of Warsaw) are deeply acknowledged for their help in NMR data collection and fruitful discussions. We thank Alain Prochiantz (UMR 7233 CNRS, Collège de France) for kindly providing the expression plasmid.